Construction monitoring for cap closure construction of Phase 5, a 32-acre landfill that contained incinerator ash and municipal solid waste. Services for this 4.5 million dollar project included field inspection, QA/QC monitoring, soil testing (e.g. nuclear density, permeability, Shelby tubes), destructive and non-destructive testing of the liner system, and certification in accordance with New York State Department of Environmental Conservation Part 360 Regulations. 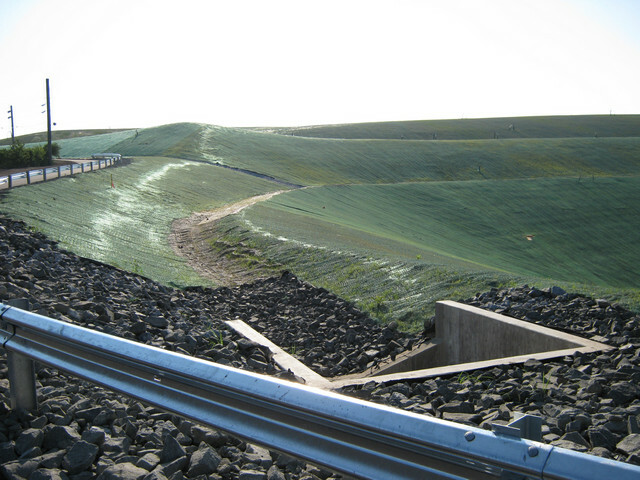 Construction included shaping subsurface waste material to the proposed grades, gas venting soil layer, gas collection piping, geomembrane liner, geocomposite drain layer, composite cap component “GCL”, barrier protection soils, erosion control fabric on side slopes, erosion control mat in drainage swales, interconnecting concrete filled mat system at the down chute area, precast concrete drainage channel around the perimeter of cap, access roadway to top of cap area, radio tower with spread footing, storm water piping, and gas piping system to co-generating facility. Design and Construction monitoring for cap closure construction of multiple Cell 5 phases of the Town of Brookhaven’s that contained construction and demolition debris. Services included field inspection, QA/QC monitoring, soil testing (e.g. nuclear density, interface friction), destructive and non-destructive testing of the liner system, and certification in accordance with New York State Department of Environmental Conservation Part 360 Regulations. 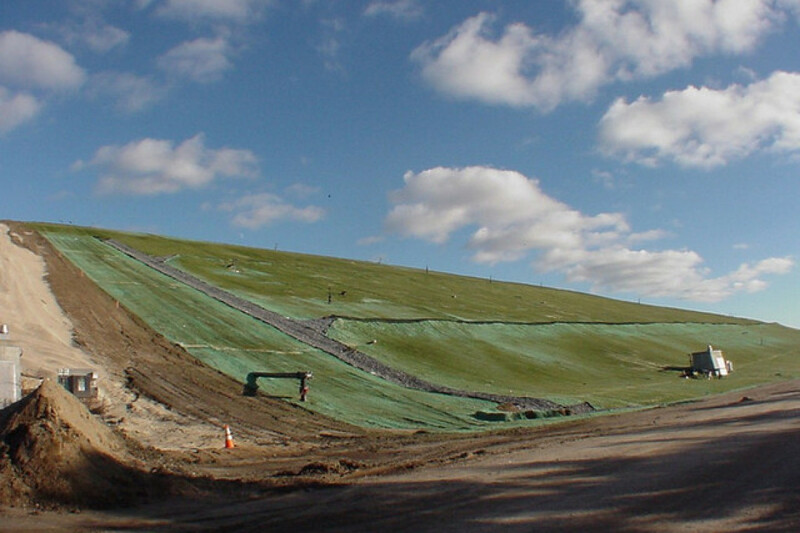 Construction included excavation of waste, consolidating waste material, shaping subsurface waste material to the proposed grades, common fill soil layer, soil filter layer, gas venting soil layer, gas vent piping, 40 mil LLDPE geomembrane liner, geocomposite drain layer, barrier protection soils, erosion control fabric on side slopes, erosion control mat in drainage swales, Reno baskets filled with angular rip-rap at the down chutes, inlet structures for collection of stormwater with piping to the recharge basin and layering of topsoil with seed. 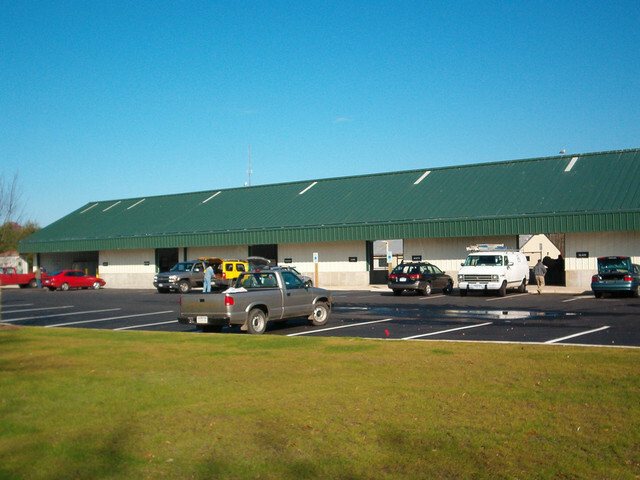 Provided permitting, design, construction monitoring and certification services for the construction of a 17,000 SF addition to the Town of Brookhaven’s existing Municipal Solid Waste (MSW) Transfer Station Building. The project involved the erection of a 90’ by 190’ clear span, for a metal building designed to handle the transfer of over 1000 tons of MSW per day. A climate controlled office/break room was provided with bathroom facilities. Over 4500 tons of asphalt and 200 linear feet of 12’ high pre-cast concrete pushwall were installed. A significant cost savings was realized when LKMA developed a design that utilized and expanded upon an existing concrete ramp/pit. This ramp/pit expansion allowed for continuous trailer traffic flow and expedited trailer loading. 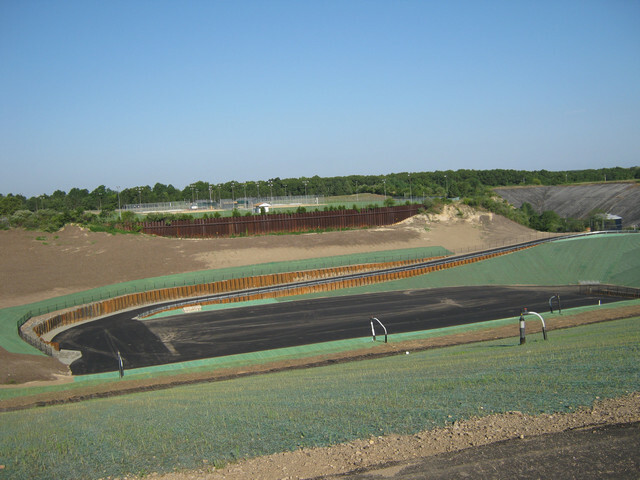 In 2009, LKMA was hired by the Town’s Department of Waste Management to permit and design a new fueling station at the Brookhaven Landfill. The new facility would not only serve the Department’s fueling needs (diesel and gasoline) but serve as a regional fueling facility for local ambulance districts, fire departments and other Town of Brookhaven Departments. LKMA secured all permits from the County, prepared contract drawings and specifications for construction and observed the tank installation/construction of fueling facility. The fueling station is backed up by an emergency generator and has served the Town’s fueling needs since 2010. Design and construction monitoring of a 2,000 SF concrete block and steel building scale monitoring stations, offices, and break room area. The scale house includes reflective glazing, full video surveillance systems integrated into the invoice software and monitoring of personnel, radiation detection system, computerized billing, pneumatic dispatch systems, motorized server drawers and an emergency generator. The project also included an information booth with similar amenities. Installation of a new utility flare for landfill gas control at the Town of Brookhaven Landfill including construction of new inlet piping. 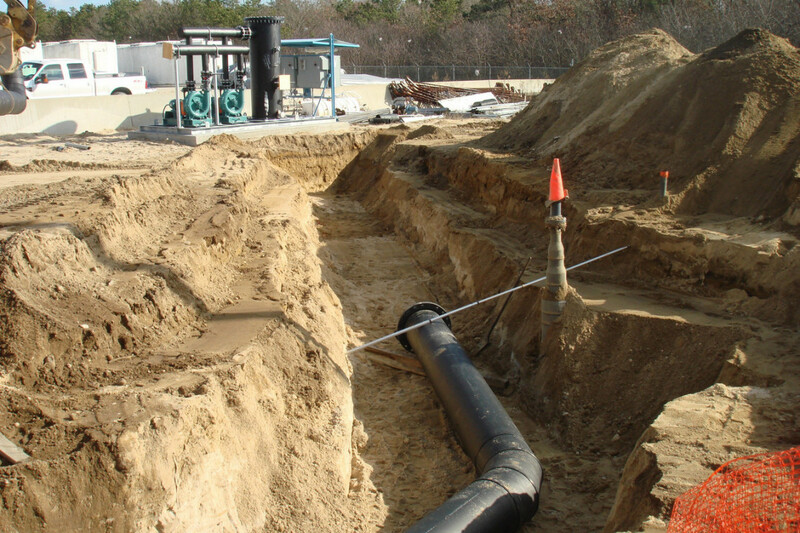 Design and construction monitoring (certification) for cap closure construction of the 25 acre area of the Town of Smithtown’s Cell 6 Landfill on Old Northport Road in Kings Park. The project involved the preparation of an engineering design report, cap closure construction plans and a QA/QC Report for the purpose of obtaining approval from the NYSDEC. The site was challenged by limited area for yard waste handling & processing operations which were conducted on the inactive landfill. 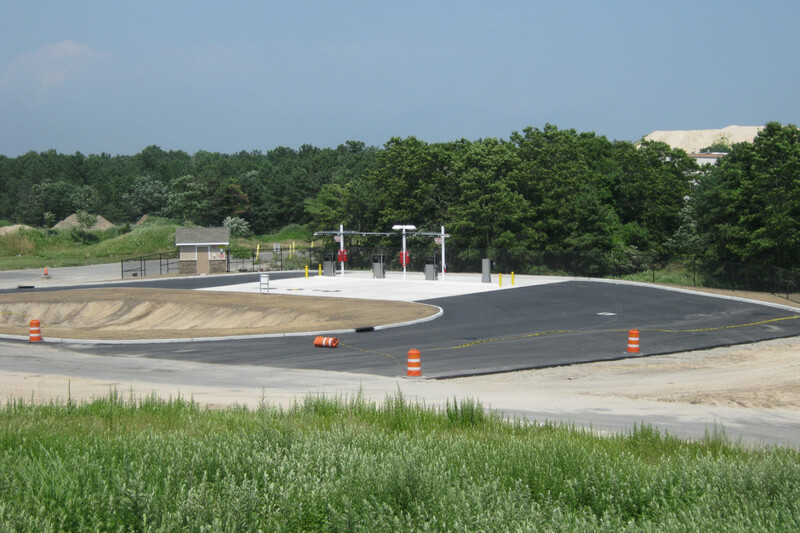 The final design incorporated the construction of a new roadway Smithand waste processing area situated between the capped landfill and recreational softball fields. The cap closure project was completed in 10 months (from September 2009 to July 2010) and received final certification approval from the NYSDEC in October 2010. The project was constructed by Terry Contracting & Materials of Riverhead, NY. 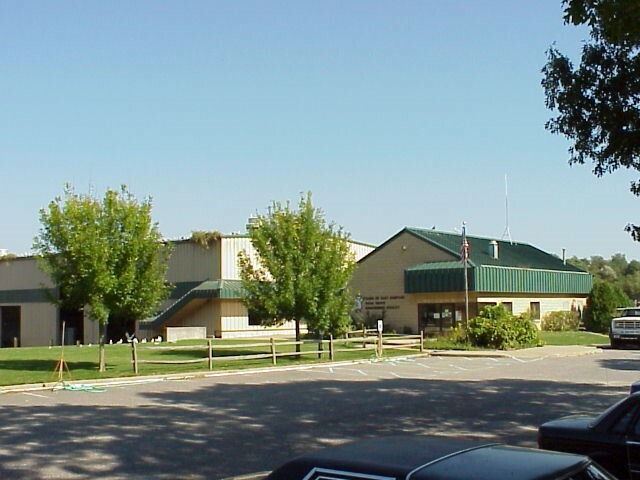 Design, permitting, and construction monitoring services for a 20,000 SF Material Recycling Facility (MRF) including adjoining 3,000 SF administration and education center. All of the work was performed in conformance with the New York State Department of Environmental Conservation Part 360 and Suffolk County Health Department Regulations. There is no Town residential garbage collection in East Hampton. Residents need to drop off their garbage and recyclables at the Towns Waste Management Facility or pay a private company. This project modernized the Town operations and brought the waste and recyclables collection out from under the elements. 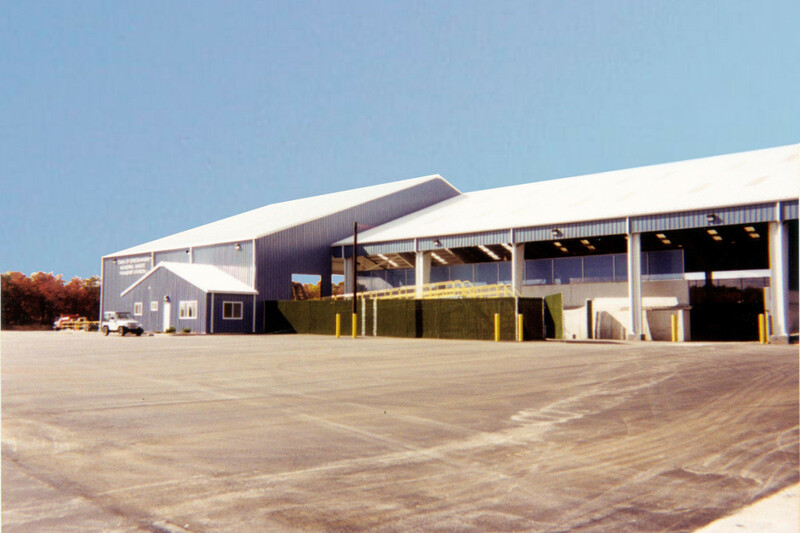 The 242’ long by 34’ wide Resident Drop-off Building provided storage for (14) roll off containers. Separate containers are provided for household garbage, paper, plastics, cardboard, metals and cans. The design kept commercial and residential traffic separated to minimize conflicts. 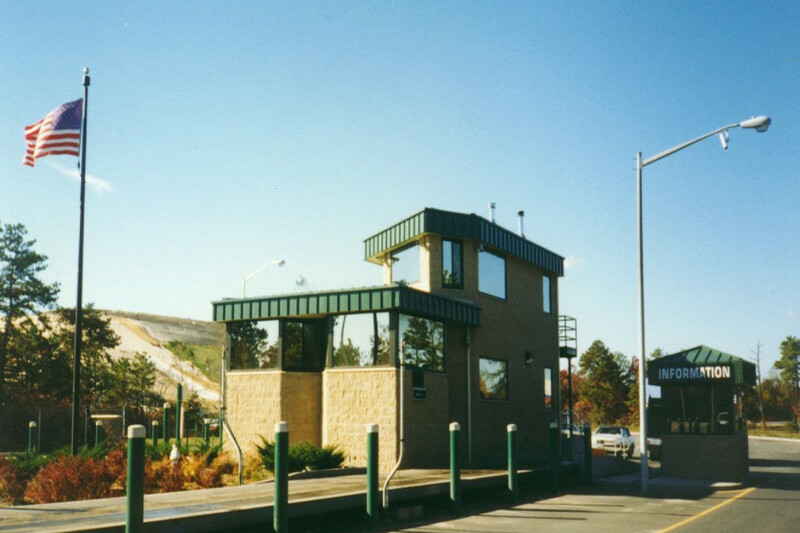 A modern computerized scale house, weigh scale, new roadway system, site lighting, Information Booth and landscaping were also part of this $2,400,000 project. LKMA provided the surveying, permitting, bid documents and construction monitoring on this project. 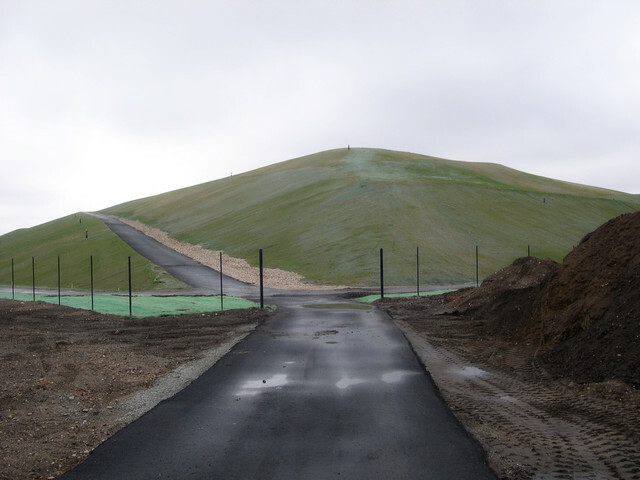 Design and Construction monitoring for closure of the Springs Landfill Site that consisted of reclaiming the entire 16 acre construction & demolition debris landfill and the conventional cap closure of the 24 acre municipal solid waste landfill (combined with the reclaimed C&D). 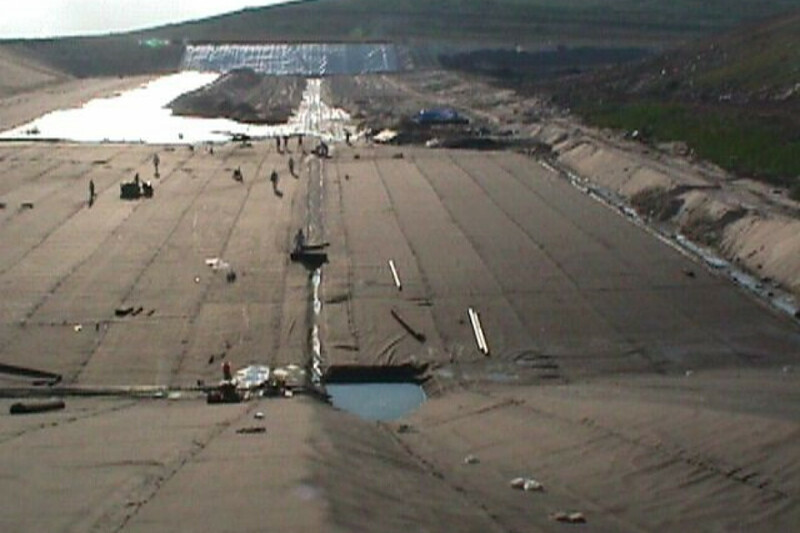 Services for this 4.7 million dollar project (cap closure) included field inspection, QA/QC monitoring, soil testing (e.g. nuclear density, interface friction), destructive and non-destructive testing of the liner system, and certification in accordance with New York State Department of Environmental Conservation Part 360 Regulations. 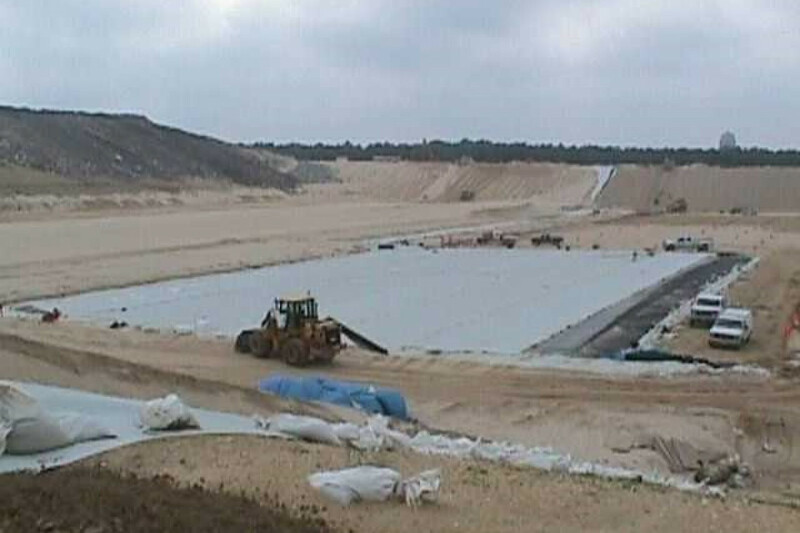 Construction included excavation of waste, consolidating C&D waste material into the MSW waste pile, shaping subsurface waste material to the proposed grades, common fill soil layer, soil filter layer, gas venting soil layer, gas vent piping, 40 mil LLDPE geomembrane liner, geocomposite drain layer, barrier protection soils, erosion control fabric on side slopes, erosion control mat in drainage swales, Reno baskets filled with angular rip-rap at the down chutes, inlet structures for collection of stormwater with piping to the recharge basin and 6” layer of topsoil with seed.